Camping food Ideas: Best Tips and Recipes for outdoor cooking! Are you looking for some Fantastic Camping food ideas? How about some Delicious Camping recipes? What about a list of food to take camping ? Plus, learn how to cook over a campfire or with a camp stove with tips and techniques so your food is delicious! Food should taste better when you’re camping than at home! Easy camping recipes – so you can spend more of your day exploring the great outdoors (instead of slaving over a fire or stove) . 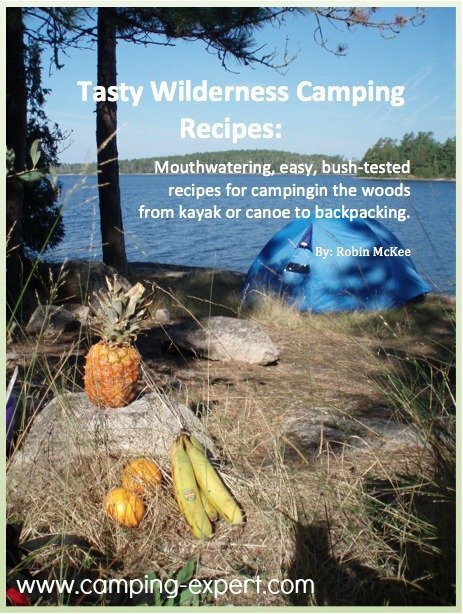 MY Wilderness recipe ebook : All my (and fellow campers) favourite woods tested recipes in one simple ebook. Get it today! Camping food list: a list of food to take camping that work for the outdoors. Such as trail mix, choosing apples (and not bananas). Fun camping recipes: Creative recipes, so that the kids can help cook if you’re family camping. Plus they’ll taste better, since you got the kids to cook dinner! Camping Menu: Tried and true menu’s that have been tested on many Interior canoe camping trips that I’ve lead. Including many recipes that can be used as backpacking recipes. 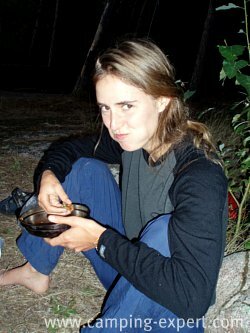 Camping cooking tips: So your meal doesn’t’ taste like an ashtray (read the ‘cigarette noodle story’). A funny story to tell, but not one to experience; Trust me, I know. Campfire cooking: recipes and tips meant for delicious campfire meals! Dehydrated food: How to make your own dehydrated meals, and why these are something that are great for camping and easier than you think! Best Tasting Protein Bars: Check out some great protein bars to take hiking! Cooking in the wilderness isn’t the same as cooking over a stove. The temperature on a camp stove or fire is often a lot hotter plus, you don’t have the luxury of a four burner stove and oven, so meals have to be more simple. Plus, food to take camping is often different than food you’d eat at home. Because the fresh air, makes EVERYTHING you eat taste better, so if you put any effort into your meals, they will taste WAY better than anything you’ll cook at home! What Are Your Great Camping Food Ideas? Do you have great camping food ideas you'd like to share? Perhaps a favourite family treat? Or a neat camping idea you learned from another camper? Share, we'd love to hear!